Public attitudes about the political system broadly and the national government specifically vary considerably around the world, though many are critical. Opinions are closely related to the status of the economy and domestic politics. Publics who have experienced high economic growth and are happy with their country’s economy are more confident in their national government. Similarly, people who support the governing party or parties in their country tend to give more positive evaluations of their democracy than those who support either the opposition or no political party at all. Publics around the globe are generally unhappy with the functioning of their nations’ political systems. Across the 36 countries asked the question, a global median of 46% say they are very or somewhat satisfied with the way their democracy is working, compared with 52% who are not too or not at all satisfied. Levels of satisfaction vary considerably by region and within regions. Overall, people in the Asia-Pacific region are the most happy with their democracies. At least half in five of the six Asian nations where this question was asked express satisfaction. Only in South Korea is a majority unhappy (69%). The survey in South Korea was conducted in February and March of this year, amid the corruption scandal that led to the impeachment of then-President Park Geun-hye. People in sub-Saharan Africa also tend to be more satisfied than others around the world with the performance of their political system. Majorities in Tanzania, Ghana, Senegal and Kenya say their democracy is working well. South Africans and Nigerians, however, are more dissatisfied. Elsewhere, satisfaction with democracy is considerably lower. In North America, 70% of Canadians say they think their political system is working well, but Americans are divided. Just under half in the U.S. (46%) are happy with their democracy and 51% are unhappy. While broad majorities in Sweden, the Netherlands and Germany say their political system is functioning well, roughly half of British and Poles say the same. Nearly two-thirds or more in southern Europe are unhappy with their democracies, including 79% in Greece. Similarly, majorities in most countries surveyed in the Middle East and Latin America express disappointment with how democracy is working in their nation. Mexicans and Lebanese are the most dissatisfied, with at least nine-in-ten in each country who say their current political system is not working well. In many countries, partisanship has a significant impact on attitudes about the functioning of democracy. People who identify with the current governing party or parties are significantly more satisfied with their political system than those who either support the opposition or identify with no political party (see Appendix for how governing party supporters were coded). For example, in the U.S., 68% of people who identify with the Republican Party say they are satisfied with their democracy, while just 40% of Americans who do not identify with the Republican Party say the same. The partisan divisions over the functioning of democracy are particularly large in Europe. Of the 10 countries surveyed in the region, six publics exhibit a gap of at least 20 percentage points in democratic satisfaction between those who identify with the governing party or parties and those who do not. Outside of Europe, the partisan divisions on this question are largest in Venezuela (43 points), Israel (39) and Nigeria (38). Attitudes about the functioning of democracy are closely tied to publics’ trust in their national government. People who are satisfied with how democracy works in their country also tend to say they trust the national government to do what is right for the country. Given that, the global distribution of trust in national governments is very similar to attitudes about the political system more broadly. People in the Asia-Pacific and sub-Saharan Africa regions are more positive about their national government than others around the world, while publics in the Middle East, Latin America and southern Europe are especially negative. Still, some countries stand out for their lack of trust. A global median of 14% say they trust their national government a lot to do what is right for the country. While this percentage is quite low, 5% or less of the public expresses this level of confidence in their national government in 10 of 37 countries asked the question: Spain, Chile, Peru, France, South Korea, Brazil, Mexico, Lebanon, Italy and Greece. As with democratic satisfaction, attitudes about the national government are deeply partisan. 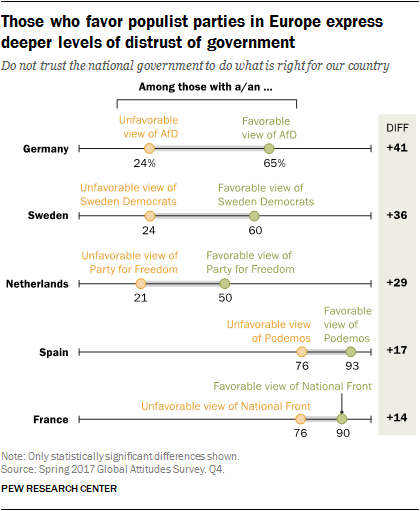 In 30 of the 37 countries, people who identify with the governing party express more trust in the government than those who do not identify with the leading party. In 13 countries, the partisan gap is 30 percentage points or more. Another key political driver of attitudes about the national government in Europe is support for populist parties. In many European countries, where rising populist sentiment has upended traditional political dynamics, people who have favorable views of populist parties are considerably more skeptical of the national government than those who have an unfavorable attitude toward these parties. The difference is largest in Germany: 65% of those who have a positive view of the Alternative for Germany party (AfD) say they trust the national government not much or not at all, compared with just 24% of those who have a negative view of the party. Moreover, most of the difference in trust between populist party supporters and their fellow countrymen comes in saying they trust the government “not at all.” In France, broad majorities of both those who like the National Front (FN) and those who do not say they lack trust in the government (90% and 76%, respectively). But among National Front supporters, 71% say they trust the government not at all, compared with 35% of people who have an unfavorable view of FN. In addition to politics, the status of the economy is strongly related to people’s trust in their government. Publics that have experienced a higher level of economic growth over the past five years tend to have more confidence in their national government to do the right thing for their country. 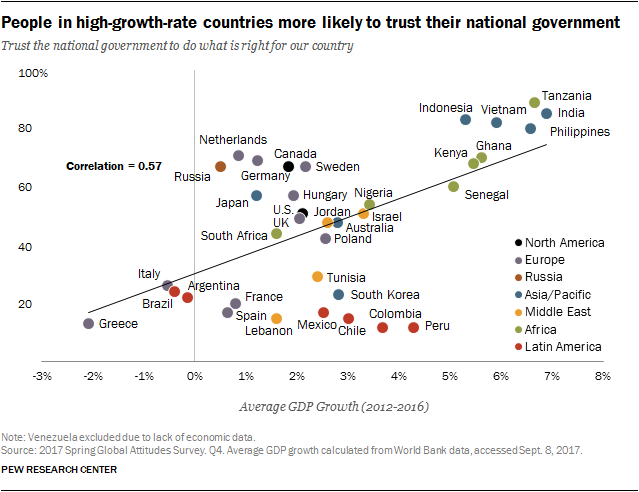 For example, in India, where the economy has grown on average by 6.9% since 2012, 85% trust their national government. Meanwhile, just 26% of Italians have confidence in their government; their economy has contracted over the past five years (-0.5% average GDP growth). This pattern appears at the individual level as well. Within each country, people who say the economy is doing well are more likely to trust the national government than those who say the economy is bad. In 29 of the 37 countries asked the question, the trust gap between those who are happy with the economy and those who are unhappy is at least 20 percentage points. As with partisan divisions on this question, European countries tend to have some of the largest differences between those who think the economy is good and those who do not.